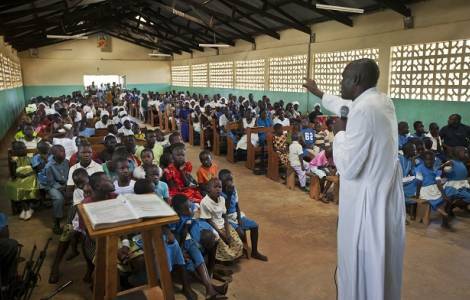 Kara (Agenzia Fides) - "Christian faith and Pan-Africanism are not two incompatible realities", says African theologian Fr. Donald Zagore, noting that most of those who unconditionally adhere to the various Pan-African movements show radical hostility towards the Christian religion. According to Pan-Africanists, "Christianity remains a Western and colonial religion". The theologian recalls: "One of the most critical remarks is the well-known sentence of the first Kenyan president, Jomo Kenyatta, who claimed that when the missionaries arrived on the continent, they had the Bible in their hands while we had our lands: Then they asked us to close our eyes to pray. Once we opened our eyes, we had their Bible and they had our lands. This is why a fervent defender of African values, says Kenyatta, cannot in any way be a follower and accomplice of a mortal religion like Christianity". "Being Africans and being Christians would be a betrayal for them", continues Zagore. "Should we generalize by accusing the whole Church of being an accomplice of the cultural, intellectual and humanitarian genocide of Africa? ", asks the theologian, offering an answer: "The Church in its essence was not created to be a religious ramification of colonization in Africa. It lives and works for the promotion, liberation and salvation of every man through the unconditional proclamation of the Good news of salvation. These are the only reasons why the Church has walked on African soil. Pastoral workers have always been committed despite climatic, linguistic and cultural obstacles in order to give the African social structures tools that favor the development and the emancipation of the inhabitants, the most precious of all remains school". "The Church in fact - he continues - invests in teaching that offers the necessary rudiments of solid knowledge for the formation of an African intelligentsia. It is this knowledge brought to the African people that led them to challenge and even to free themselves from the colonial yoke, especially in the 1960s. It should not be forgotten that many pioneers and precursors of Pan-Africanism came from Christian schools. From these they drew the necessary strengths and tools to assert their struggle against colonialism in all its forms".